Making time to eat healthy can seem daunting. 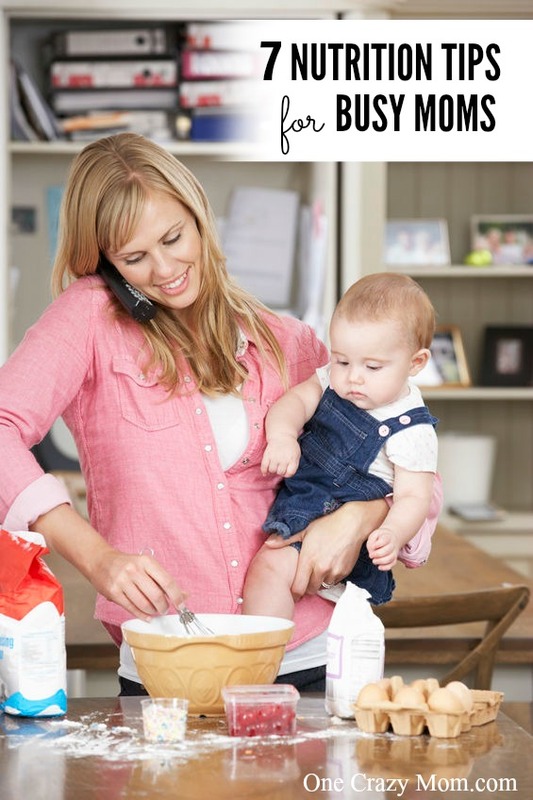 We have 7 nutrition tips for moms to make it work! When your days are filled with getting the kids off to school, making it to work on time, picking up everyone from after-school activities, preparing dinner, and making sure homework is completed before bed, it can be near impossible to focus on your own health. Honestly, one of the most important things you can do for your family is to take good care of yourself – if you properly fuel your body, you will have more energy and be better equipped to manage daily stress. Easier said than done, right? Wrong! Eating well doesn’t have to require a lot of your time. Follow these simple tips to get on the right track, and before long, you’ll feel the difference! 1. Lists are your friend. Don’t head to the grocery store without a plan. If you do, you’re just asking for splurge purchases. Plan out the meals you’re going to have for the week, make your list, and go to the store. Stick to the list – get what you need and get out. You’ll save time, money, sanity, and future calories. What’s your weakness? Chocolate? Cheese? Whatever it is, eat a little each day. But just a little. Set limits on how much you’ll allow yourself, and know that it’s your treat. 3. Stop being the garbage disposal. Do you eat what’s left on your kids’ plates so food doesn’t go to waste? Stop it! Either put it in a leftover dish for your kids to eat later, or throw it in the trash. I read somewhere that moms eat an extra 500-600 calories a day just finishing up small amounts of food their kids leave behind – that adds up! 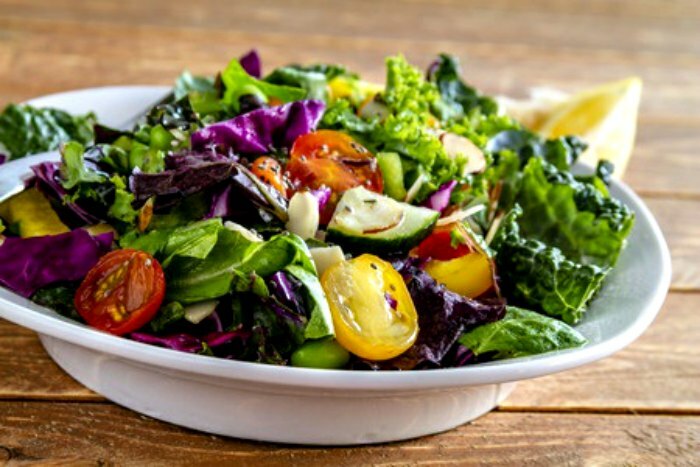 When you are rushed to throw together lunch or dinner because everyone is hungry, it is easy to fall into a habit of fast food or other convenient (and unhealthy) options. Keep a container in the fridge with cut up veggies to snack on while you’re preparing meals so you and your family aren’t ravenous. Spend a few hours on Sunday preparing for the week ahead. Make chicken, veggies, rice, and a simple stir-fry sauce, then separate it into single-serving containers. Put them in the freezer, and voila – lunch is ready for the week. Prepare a hearty vegetable and bean soup, put half in the fridge, and freeze the rest for a weeknight dinner. Freezer meals are simple and can be quick if you find the right ones! 6. The slow-cooker is your best friend. There are so many slow-cooker recipes out there that are quick and healthy, and you’ll be surprised at how good they are! Most recipes meant for the slow-cooker use water or broth rather than butter or oil, so they are better for you than pan sauces. Easy, delicious, and good for you? Yes, please! Most of us are at least mildly dehydrated, and if you’re busy, chances are even greater that you are. When you feel hungry, drink a big glass of cold water before reaching for a snack. Wait 10 minutes. Your hunger may go away because your brain could be misinterpreting thirst for hunger. Of course, if you’re still hungry, grab a handful of nuts or a piece of fruit. You’ll be surprised how much less frequently you feel hungry when you’re properly hydrated. 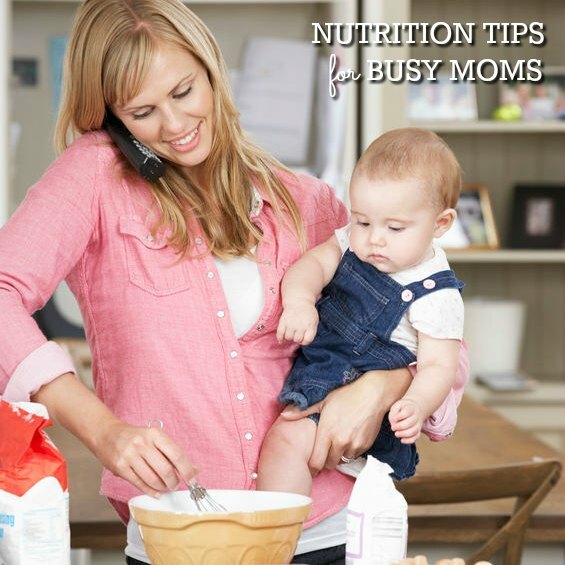 Give these nutrition tips for moms a try for a month or so and see if they help you feel better and have more energy. Come back and tell us how it went for you! Do you have other nutrition tips you like? Please share!